An expert organization builder, Sales and Marketing expert, amongst the few distinguished faculties in Real Estate Management, Mr Muttreja designed a programme in real estate management combining all disciplines of management civil, architecture, legal and research. 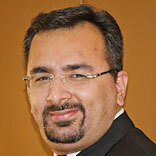 He comes with a powerful background of building brands in real estate industry. He has developed names & brands for many developer companies in no time. With a strong ability of sales & business development, he has made many companies and projects taste success and fame like never before. He is a visionary, thinker and implementer. He does not accept status quo, but uses his imagination, instinct and inspiration to create new avenues for himself and for others. He is the new-age entrepreneur and is setting new benchmarks for success every day. He does not rest easy within his comfort zone, instead of holding back due to fear of failure; he goes all out to meet challenges head-on. That is why in his first-ever entrepreneurial venture, creating a name, identity and presence for the Cosmic Group are top-of-the-list priorities for Mr Muttreja. Today he is proud to head a company that thrives essentially on the faith of its customers and investors. The journey was not an easy affair. It was his sheer conviction which transformed him and geared up for the life of an entrepreneur. He is a team player, who maintains that his biggest strength is his team. Whoever joined him when the venture was conceived, have stuck steadfastly with him. He swears by the importance of being cordial with investors, buyers, financial institutions and policy makers. He believes unflinchingly that earning the trust and goodwill of people, winning them over, is more important than just earning money. This is why he exhorts his team to work by the principles of transparency and trust across all levels. He is guided by the passion of transforming his company to a global podium in the next few years as he has put the company on an aggressive growth path. He is armed with just determination and a keen eye to spot opportunities. He has crafted the success story of Cosmic Group along with his team of diverse intellect and expertise in different segments. The sky is the limit for him, who continues to dream big and follow it up with seamless execution.